I turned in 651 signatures on 18 forms on Wednesday to place my name on the ballot for Dayton City Commission. The Board of Elections has checked, rechecked and checked again and unfortunately, they were only able to knock out 12% of my signatures. Of the 651, I had 575 “good signatures’, 7 duplicates, 5 lined out, 1 in pencil, 1 missing a date, 24 not registered, 10 out of jurisdiction and one by a circulator. 27 Signatures didn’t match what was on record (probably meaning they printed). The only other petitions turned in so far have been Nan Whaley who turned in 1495 signatures with an 80% validity rate for Mayor, and Joey Williams with a 72% valid (meaning slightly more than 1 in 4 was was incorrect) for City Commission. 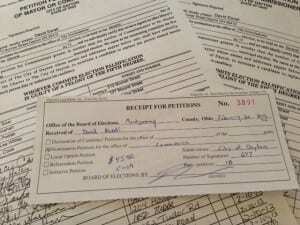 If more than 4 candidates turn in 500 valid signatures, there will be a primary in May. If not, the four (or less) will run for the seats held currently by Nan Whaley and Joey Williams. The Dayton Daily News gave a large story about Darryl Fairchild running for Dayton City Commission- despite his not having turned in valid petitions or being placed on a ballot. I doubt they will do the same for me. We will see if the Dayton City Paper gives me a front page story like they have for A.J. Wagner or Nan Whaley. I’ve posted the “racing form” of candidates and potential candidates at this time. The Board of Elections will meet on 26 Feb to certify petitions turned in so far. Ask Nan or Joey if they support doing away with this ridiculous process or fixing the charter’s rules about % of registered voters instead of % of actual voters to change the charter or to remove elected officials? They’ve both put 2 sets of charter changes on the ballot and ignored this exclusionary process from reform. The only jurisdiction that required a notary public to “Certify” the petitions was Oakwood, and they did away with it last year. I’ll be announcing 2 fundraisers later today for Elect Esrati. And, like the Mayor, I’m limiting my campaign to $10,000. I’m sure I’m missing something, but why would Nan file a petition for Commissioner if she’s running for Mayor? @kim- Nan turned in for Mayor- I’ll clarify. All seats are on the commission, but- you are right, I’m not clear.